Calorie counting seems to be the bane of all dieting. How many times have you wished you could find a diet program that enables you to eat everything you want, without limits, without calorie-counting, without measuring your food? Well, Slimming World’s diet program, also known as the “Syn diet” (or “Syn-free diet), promises to offer all of that. According to the UK’s popular diet program which is now making its way to the US as well, no food is banned and there’s no calorie counting. Sounds too good to be true? While the Slimming World’s Syn-free program might offer certain benefits, it’s definitely not a one-size-fits-all kind of solution and there are more than plenty of serious health concerns related to this diet program. In fact, it might even end up hurting you rather than helping you achieve your ideal weight and desired health goals. The Slimming World’s diet plan revolves around Food Optimizing which divides food into 3 groups: Free Food, Healthy Extras and Syns. According to the diet plan, people can eat the Free Food items in infinite amounts. Slimming World allows these food items to be eaten as much as people wish since, according to Slimming World, these foods are filling and low in calories, so they keep us feeling fuller for longer. Slimming World literally advertises the plan by saying that Free Food is something you can eat in unlimited amounts and you can still lose weight. The second group, called Healthy Extras, is compiled of foods like milk, cheese, cereals, and whole wheat bread and these should be eaten in limited amounts. Slimming World members are allowed to eat 3 portions of these foods per day. And everything else is basically considered a “Syn”. Syn, a word derived from Synergy (as Slimming World describes their diet plan to be a synergy between the 3 groups) refers to so-called sin-foods – items that are high in calories but less fulfilling such as candy, cake, and alcohol. Members are allowed to eat a limited amount of Syns per day depending on the exact plan they’re following; each food item has a designated Syn value. Maximum of 10 Syns are allowed for those who follow the Extra Easy SP plan. Is the Slimming World’s diet backed with scientific proof? Slimming World’s whole diet program is based on two core elements: energy density and appetite control. According to their belief, certain food items are “low energy-dense” and provide the feeling of fullness for longer, meaning you won’t grab another meal so soon as you would when you’d eat a “high energy-dense” food such as cookies. The real question is though, is there any actual science backing that claim? Slimming World itself has referred to their program being backed by a study that was led by the University of Leeds. A study “Low Energy–Dense Diet in the Context of a Weight-Management Program Affects Appetite Control in Overweight and Obese Women” was indeed published in 2018 in the Journal of Nutrition. The study came to the conclusion that consuming low energy-dense meals was likely the reason why people have lost weight in the Slimming World’s program. While that might seem like a solid base for believing in the science behind Slimming World, this study was, in fact, funded by Slimming World itself. What’s more, 2 people working on the study are closely connected to Slimming World, one of them being employed by Slimming World UK and the other consulting for Slimming World. This massive conflict of interest together with the study being funded by Slimming World are enough reasons to cast a few shadows of a doubt when it comes to believing the study’s results. The question of how satiety depends on the food’s fat and carbohydrate content has been researched by others though, who have found that there might be certain truth behind low-fat/high-carb foods increasing satiety. A study called “Macronutrient composition & food hedonics” conducted by Sheffield Hallam University found that low-fat/high-carb foods may help promote better short-term appetite control. Is it healthy to avoid fats? Opting for a low-fat diet might not be the answer to the problem though. Low-fat diets have been actively promoted as heart-healthy diets for years now, but it was recently found that Harvard researchers were actually paid to falsify results of their study, to showcase fats as the “big bad culprits”. Because of this, people have believed for years that the best way to go is to opt for carbohydrates instead as they contain around 4 calories per gram while one gram of fat contains twice as much. However, it takes more than lowering your caloric intake to lose weight. If you consume more carbohydrates, you keep your insulin levels high which also hinders your body’s ability to lose weight. Beyond that, all the extra carbs will get stored as fat when they’re not used for energy which means that fats are not really to blame for overweightness. And as if that’s not enough, researchers have found that increasing your carbohydrate intake while decreasing your fiber intake has actually increased the risk of type 2 diabetes in the US. Another problem related to low-fat diets are the foods that are being used to replace the previously consumed fatty foods. While 0-fat/low-fat alternatives might sound like the perfect choice for an afternoon snack, low fat content doesn’t necessarily mean the product is healthy or should be consumed in high quantities. Take for example the popular Müller Light Yogurt which Slimming World members consume as their preferred snack. As per Slimming World’s guidelines, members should opt for products with as low fat content as possible. Müller Light Yogurt does indeed contain only 0.1 grams of fat per 100 grams but it also contains 7.8 grams of carbohydrates, 7.1 grams of which are sugars. 7.1 grams might not seem much but the American Heart Association (AHA) suggests consuming only 25 grams of added sugar. By eating 4 Müller Light yogurts which seem to be healthy alternatives because of their low-fat content you are already way above your daily suggested sugar intake, increasing your risk for type 2 diabetes tremendously. Now consider this: one Müller Light yogurt is equal to 1 syn point in the Slimming World’s diet program. Members are allowed to eat 5 to 10 syns per day, meaning that you could, per your syn-count, consume 10 Müller Light yogurts to still stay within your syn-limit. One Müller Light contains 12.425 grams of sugar (since one yogurt is 175 grams), meaning that 10 Müller Light yogurts contain a staggering 124.25 grams of sugar which is almost 5 times more than the recommended daily sugar intake. In its essence, Slimming World’s diet plan indeed doesn’t require you to count calories and it allows certain food items to be eaten in unlimited amounts. However, no matter how tempting this may sound, the diet plan poses several health problems, including mental health issues. The first issue arises from the cornerstone of Slimming World’s program: the syns. Certain foods are classified as “syns” which, of course, sounds awfully lot like “sins”. Labeling certain food items as a “sin”, however, is not just in bad taste but also fuels negative self-image and destructive attitude towards certain food items. Nutritionist Rhiannon Lambert voiced her opinion on this matter very openly by saying to The Independent: “Naming certain foods as ‘Syns’ just contributes to unhealthy anxiety that prevails around food all too often.” She continued by saying this classification is a guilt-ridden idea which especially hurts people who’ve struggled with eating disorders – the people who should, in fact, get the most benefits out of Slimming World’s diet program. Since some foods are labeled as syn-free – foods that may be eaten as much as one wishes – the program can also contribute to unhealthy consumption of these supposedly healthy food items, leading to obsession and even food addiction. In the light of Müller Light yogurts being changed from Free Food to Syn-food and all Müller Lights getting a specific syn-value (most yogurts being equal to 1 syn), many Slimming World members have shared how the change affects them, with many admitting they consume Müller Lights in high quantities due to the yogurt being syn-free. One of the most notable examples is a woman who became addicted on the Müller low-fat yogurt since it was “free” to consume in the diet plan, but satisfied her craving for sweets, so she consumes 6 to 8 yogurts per day, sometimes, however even as much as 18 to 24 yogurts! The woman told to Mirror Online how she actually never liked yogurts before joining Slimming World but then realized how ‘great’ of an alternative the yogurt is for her usual sweet snacks. She even went as far as to say that she ‘panics’ when she doesn’t have the yogurts in her fridge. That’s not the first time a popular syn-free (or low syn) product has later received a (higher) syn-value. The most notorious case arouse in 2017 when Slimming World claimed that the popular Porky Lights sausages are not so low-fat as they’ve promised on their packaging and therefore, the sausages jumped from previous 0.5 syn-value to 4.5 syns, leaving Slimming World dieters enraged. The manufacturer of Porky Lights has denied those claims though and is adamant about the sausages being as low-fat as originally claimed. Slimming World has recently made many changes to their diet rules, some of the changes being fundamentally significant. New changes include light soft cheeses, reduced fat cheeses, and soft goats cheeses being cut from the Healthy Extras list and dairy-free drinks like almond milk being decreased to 400ml among other things. These alarming changes indicate issues with the diet plan’s consistency and hint problems with the diet program’s actual usefulness. If something as significant as light soft cheese is being reclassified, how can a dieter be certain that something else isn’t reclassified soon? And how can a dieter trust the program’s dieting rules if the company changes the syn-values, indicating that the food item was never as healthy as thought? Though Slimming World promotes the diet plan saying there’s no need for counting or measuring food, the “freedom” given with the plan might actually thrive people off the edge more easily and contributes to an unhealthy relationship with food. When some foods are listed as “free” and “consumable in unlimited amounts” while other food items are “sinful”, it doesn’t instill healthy attitude towards food; instead it deepens possible food addictions and obsessions towards “healthy unlimited foods” as displayed from Slimming World members’ raging replies after certain changes being made. Should a diet really bring out negative emotions in such magnitude? Probably not. Can you really eat something in unlimited amounts? Of course, Slimming World diet plans aren’t as black and white – balanced diet is promoted and members are encouraged to mix-and-match food items, consuming a healthy amount of the Healthy Extras and the ‘fulfilling free foods’. However, in the center of the diet plan, there are still certain foods that are, in their essence, allowed to be consumed in unlimited amounts. Slimming World’s public health manager Carolyn Pallister said to Netmums: “In theory, you could eat a whole chicken if you wanted to, as long as the skin and fat were removed and it was cooked in a healthy way.” She believes though that the diet is in itself calorie restricting since people won’t consume the free foods in such large quantities anyway. While it might be true that devouring a whole chicken is not something you’d munch on an average night, there are plenty of food items among the ‘free foods’ that pose a serious threat when consumed in above normal quantities – quantities that might not even seem much. One of such items was the Müller Light yogurt which was previously syn-free but was consumed by dieters in large quantities – such as more than 5 packets per day. As a result, dieters consumed incredible amounts of sugars without even realizing it and as Slimming World understood the extent of yogurts being consumed because of their guidelines, they raised the yogurt’s syn values. But even everyday food items might pose a threat, though Slimming World has claimed such food items to be ‘free’ and ‘consumable in unlimited amounts’. To be realistic, no food item can be consumed in unlimited amounts without having any consequences. Eggs, an everyday food most of us consume, belongs to the ‘free food’ category in Slimming World, but consuming eggs every day can increase your risk of heart problems and not because of the dietary cholesterol amount. A study published in the New England Journal of Medicine found that our gut bacteria metabolizes choline into a substance called trimethylamine-N-oxide (TMAO for short). Why is that bad? Higher TMAO level can significantly increase the risk of heart disease. Choline, however, is found abundantly in animal products like eggs and meat. Consuming too many fruits and vegetables might have adverse effects as well. Fruits and vegetables are, of course, necessary and contain loads of essential nutrients, but problems arise when these foods are consumed excessively. Fruits are still rich in carbohydrates and sugars and consuming too many sugars, no matter if it’s added sugar or not, can lead to a number of health problems. Even water cannot be consumed in unlimited amounts, leading to serious kidney issues. Slimming World’s diet is in its essence a low-fat-low-calorie diet which has found many fans due to the diet plan’s simplicity: no calorie counting, no limitations. However, those promises don’t seem to hold much value because, at the end of the day, even Slimming World’s diet plan comes with its restrictions. What’s even more, nothing should be consumed in infinite amounts – not even vegetables or fruits. What matters is a healthy balanced approach to your diet, not classifying certain foods superior to such an extent that they could be eaten in “unlimited” amounts. At the same time, classifying some foods as sins can fuel discontent and in some cases, Slimming World’s diet plan can even lead to food addiction and obsession. Always keep in mind your body’s nutritional needs and follow a balanced diet. 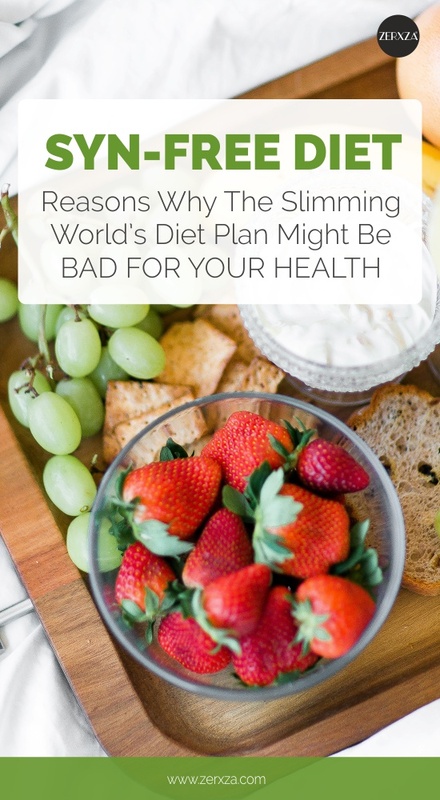 If you want to follow the Slimming World’s diet plan though, be sure to check it with your doctor first and ask for recommendations on how to create a healthy diet that works well for your specific needs. Don’t trust a diet blindly – there’s no single diet that can fit for everyone. Previous articleIs It Really Better to Opt for “Fat-Free” Options? Next articleWhy Is Your Kid Actually a Fussy Eater?